You know you need to bone up on the test material before it’s time for your exam. How can you be certain that you’re studying the right things? With Go And Drive, you never have to guess. We grant you ready access to the best source of knowledge available. 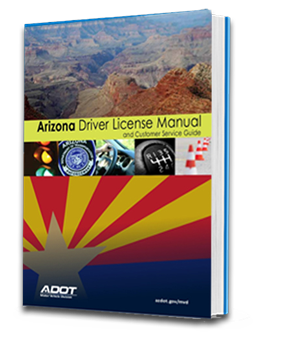 The Arizona Driving License manual let you download critical information and study when it’s convenient for you. Whether you prefer to review on your home computer or your smartphone during a lunch break, you can learn everything that you need to know to face your DMV test with courage. This Driver License Manual and Handbook is also popular with those who simply want to become better motorists. Parents love using them to ensure that they’re teaching their kids properly, and they’re ideal for corporations that need to manage company vehicles safely. Order your copies today. Purchasing our manuals is the perfect way to succeed for your MVD test. Since we use officially approved versions of the Arizona State’s driving handbooks, you always know that you’re receiving the correct information. Why settle for uncertainty when it’s this easy to become knowledgeable at your own pace? Download the copy of your Driver License Manual and Handbook today.